International Day for the Preservation of the Ozone Layer is celebrated on September 16 to commemorate signing of the Montreal Protocol, one of the most successful environmental treaties. The Protocol was signed by 197 parties in 1987 to control the use of ozone-depleting substances, mainly chlorofluorocarbons (CFCs). Twenty-nine years after the Montreal Protocol was adopted, CFCs have been phased out. US space agency NASA has reported that the size of the ozone hole in the atmosphere has decreased. While it may seem that the purpose of Montreal Protocol has been achieved, using HFCs as an alternative will contribute to another problem: global warming. HFCs do not deplete ozone but have high global warming potential. If the use of HFCs continues to increase, they may account for 9-19 per cent of greenhouse gas emissions by 2050. Recognising the damage HFCs can cause, countries are negotiating their phase down. The course of Montreal Protocol has changed from ozone protection to reducing greenhouse gas emissions. Parties will meet in Rwanda this October to finalise an amendment to the Montreal Protocol on HFC phase down. They will negotiate on baseline, cut-off date and transition period. Finance, intellectual property rights of new chemicals and flexibility in choosing alternatives are crucial issues for developing countries. Support to small-scale industry and servicing will also hold significance for countries heavily dependent of small and medium enterprises or having low consumption. For a fruitful phase down, it is important to prioritise environment-friendly, energy efficient, non-patented and low GWP refrigerants. Ozone Day has been celebrated for preserving the ozone layer. Addressing climate change and global warming—problems that alternative chemicals are partially responsible for—need to the clubbed with safeguarding ozone. Ozone day cannot be about Ozone alone anymore. COUNTRIES ARE negotiating a treaty to reduce the use of hydrofluorocarbons (HFCs) under the aegies of the Montreal Protocol. Under the protocol, which was adopted in the early 1990s to eliminate the use of ozone-depleting chemicals, the world aims to phase out over 100 chemicals. So far, countries have phased out chlorofluorocarbons (CFCs) that were used as a refrigerant. Chlorodifluoromethane (HCFC-22) that is part of hydrochlorofluorocarbon group of chemicals (HCFCs) was the main replacement for CFCs and is used as a common refrigerant in India. But HCFC-22 is a moderately ozone-depleting gas and is being phased out under the Montreal Protocol. While developed countries have achieved the target, developing countries like India will have to stop using HCFCs by 2030. India has put in place a law to curb the use of HCFCs in a phased manner. But there is no law to curb the emission of trifluoromethane (HFC-23), released during its production. Though HFC-23 does not harm the ozone layer, its global warming potential is 14,800 times more than that of CO2. Developed countries have replaced HCFCs with HFCs and developing countries are following suit. But given the concerns over climate change, countries now plan to phase down the use of HFCs as well. It is in this context HFC-23 is being discussed under the Montreal Protocol. As of now, HFC-23 has no use and it is being destroyed or emitted as a waste product. In India, five fluorochemical companies manufacture HCFC-22. They have incinerators to destroy HFC-23, which they had procured under the Clean Development Mechanism (CDM) of the UN Framework Convention on Climate Change. During 2007-2013, these companies destroyed the gas and sold the carbon credits to developed countries under CDM. For every tonne of HFC-23 destroyed, they earned 14,800 carbon credits. This translates into a profit of over US $1 billion till 2012 -13. But it is not known if the companies continue to destroy HFC-23 following the collapse of the carbon credits market in 2012-13. When Down To Earth contacted the companies, they refused to divulge the amount of HFC-23 they make and if they still destroy it. Such attitude of companies is not limited to India. Worldwide, 19 other refrigerant facilities have installed HFC-23 incinerators under CDM. These are in China, Argentina, South Korea and Mexico. Destroying HFC-23 was so profitable under CDM that several companies, mainly in China, increased the production of HCFC-22 just to be able to destroy HFC-23. This prompted New Zealand to stop trading in carbon credits in December 2012. The EU did the same in January 2013. These were the two major buyers of carbon credits. The levels of HFC-23 in the atmosphere have rapidly increased since the collapse of the carbon credits market. This indicates that HCFC-22 industries continue to emit HFC-23. Estimates show that in the business-as-usual scenario, all the HCFC-22 manufacturing units in the world will release more than 2 billion tonnes of CO2 equivalent of HFC-23 into the atmosphere by 2020. So far, China is probably the only country that has successfully managed to persuade its companies to destroy HFC-23. In China, when companies were making windfall gains under the CDM regime, the government imposed a 65 per cent tax on CDM projects involving HCFC-22. While the Montreal Protocol requires countries to phase out HCFCs by 2030, China has collected enough money to incinerate its by-product, HFC-23, for at least 50 years under the business-as-usual scenario. Yet, after the collapse of the carbon credit market, China introduced a temporary subsidy in 2015 to ensure that companies continue to incinerate HFC-23. Under this policy, the National Development and Reform Commission, China’s top economic planning agency, provides subsidies to companies that are manufacturing HCFC-22 but have not had access to CDM. Depending on the production capacity, new companies get up to 15 million Yuan (R150 million) to buy HFC-23 incinerators. The companies that received funds under CDM will also get subsidies up to 4 Yuan per tonne of CO2. The subsidy will be reduced every year and end in 2020. India did not impose tax on fluorochemical companies when CDM was in place and allowed them to make huge profits. So unlike China, the Indian government is not obliged to incentivise companies to incinerate HFC-23. But there is an urgent need to introduce legislation so that the emission of this super greenhouse gas can be prevented. Realising the importance of controlling HFC-23 emission, the National Green Tribunal in December 2015 directed the Ministry of Environment, Forest and Climate Change and other concerned authorities to carry out a study on the units that make HCFC-22. It also asked the ministry to provide guidelines on the storage, emission and incineration of HFC-23. An analysis by Down To Earth shows that capture and destruction of HFC-23 is inexpensive and costs less than Rs 15-25 per tonne of CO2 equivalent. This means companies manufacturing HCFC-22 will have to spend as little as R300 lakh a year, which is 0.2 per cent of the revenue they earn. Over the next 15 years, they would require only R25 crore to incinerate HFC-23 till they stop producing HCFC-22 by 2030. This is 0.5 per cent of the money these companies made by selling carbon credits from HFC-23. As countries negotiate to phase down HFCs, HCFC-22 companies are demanding money to incinerate HFC-23. Chinese companies are in the forefront, but Indian companies are also demanding this. Under the Montreal Protocol, developed countries are obligated to provide financial and technical support to developing countries to reduce the use of chemicals. Asking money to destroy HFC- 23, when these companies have made so much money from it in the past, is not only unfair but unethical. The Indian government should not support this demand of its industry. Instead it should enact a law to make it mandatory for the companies to destroy HFCs. This will not only showcase India’s leadership position in dealing with HFC issues, but also help the Indian government gain a foothold while negotiating its phase down. It is simple mathematics. We can only emit 990 billion tonnes of CO2 between 2012 and 2100 if we want to keep the rise of global temperature to less than 2 degrees. HFC phase-down and a direct transition to natural refrigerants can help eliminate 5-8 billion tonnes of CO2e. Adopting AC technology that is both cost-effective and energy-efficient could save over 192 terawatt-hours per year by 2020-the same amount of energy as produced by 64 medium-sized power plants. Appliances are rated with energy stars based on power efficiency. Energy efficiency of an appliance is improved by 10-30 per cent with the use of low GWP alternatives. Each star rating signifies a reduction in power consumption by around 6-8 per cent. For example, a 1-star refrigerator will consume nearly 750 units (kWh) of electricity a year. That comes to over two units a day. Whereas a 5-star rated refrigerator will consume only a little over 300 units a year, less than one unit a day. Therefore, low GWP alternatives will have climate and energy benefits. Godrej is the first and only company in India that makes 100 per cent environment friendly refrigerators with help from GIZ-a German Federal Government enterprise. These refrigerators are 100 per cent free of chlorofluorocarbons, hydrochlorofluorocarbons and HFCs. Godrej is also registered in the Bureau of Energy Efficiency as a participant in the Energy Standards and Labelling Programme. Its split ACs are 5-star rated. It uses naturally available hydrocarbon technology. THE WORLD is at a crossroads. Just like in 1990. That year, countries agreed to phase out the use of gases like chlorofluorocarbons (CFCs) that deplete the ozone layer of the atmosphere. Ozone protects the earth by blocking ultraviolet radiation that can cause diseases like skin cancer, damage crops and threaten the lives of other organisms. CFCs, used as refrigerants, are also super greenhouse gases. A molecule of the most commonly used CFC—CFC-12—is 10,600 times more potent in causing global warming than a molecule of carbon dioxide (CO2). Under the Montreal Protocol, an international treaty to protect the ozone layer, developed countries phased out the production and consumption of CFCs by 2000 and developing countries by 2010. Countries moved from CFCs to hydrochlorofluorocarbons (HCFCs). HCFCs were touted as an interim solution as they were less harmful to ozone than CFCs. But they too caused global warming. 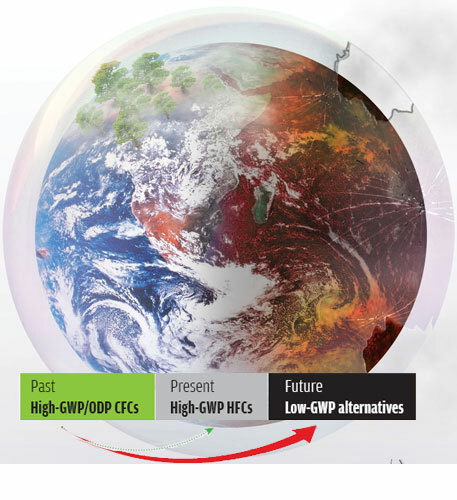 The global warming potential (GWP) of HCFCs is a thousand times that of CO2 but comparatively less than that of CFCs. But in 1990, countries had the option to move to a completely different type of gases called hydrocarbons to replace CFCs in the refrigeration and air-conditioning sectors. Hydrocarbons, such as butane and propane, are excellent refrigerants which do not deplete ozone and have very low GWP. But the economic interest of the developed countries and multinational companies triumphed, and instead of non-patented hydrocarbons, patented HCFCs were forced on every one. As it was an interim solution, developed countries took a pledge to freeze the production and consumption of HCFCs by 2004 and phase them out by 2020. Developing countries also agreed to freeze HCFCs by 2013 and phase them out by 2030. Since 2004, developed countries have started substituting HCFCs with hydrofluorocarbons (HFCs). HFCs are again patented fluorinated gases pushed by multinational companies. Though they do not deplete the ozone layer, they have high GWP, comparable to HCFCs’ and in some cases higher. Most developed countries have moved to HFCs. Now it is the turn of the developing countries. They too want to move to HFCs because HFCs are widely available and a tested technology. Additionally, in countries like India the refrigerator and air-conditioning sectors are dominated by Korean and Japanese companies. As these companies have moved to HFCs in their developed world markets as well as in their own countries, they want to use HFCs in countries like India as well. The question is whether India should move to HFCs. At present, the total contribution of HFCs to global warming is about 1 per cent. But with the scheduled phase-out of most HCFCs by 2030, it will increase. HFCs are fast replacing HCFCs in refrigeration and air-conditioning equipment, blowing agents for foams, aerosol sprays, fire protection systems and solvents. Between 2004 and 2008, CO2 equivalent emissions of HFCs increased by nearly 8 per cent annually, mostly in the developed countries. At present, 80 per cent of all HFCs are emitted by developed countries but the contribution of developing countries is increasing sharply. According to various studies, the emissions of these gases, if unchecked, could reach between 3.5 billion tonnes and 8.8 billion tonnes CO2 equivalent per year by 2050, contributing 7 per cent to 19 per cent of the total greenhouse gas emissions in a business-as-usual scenario. 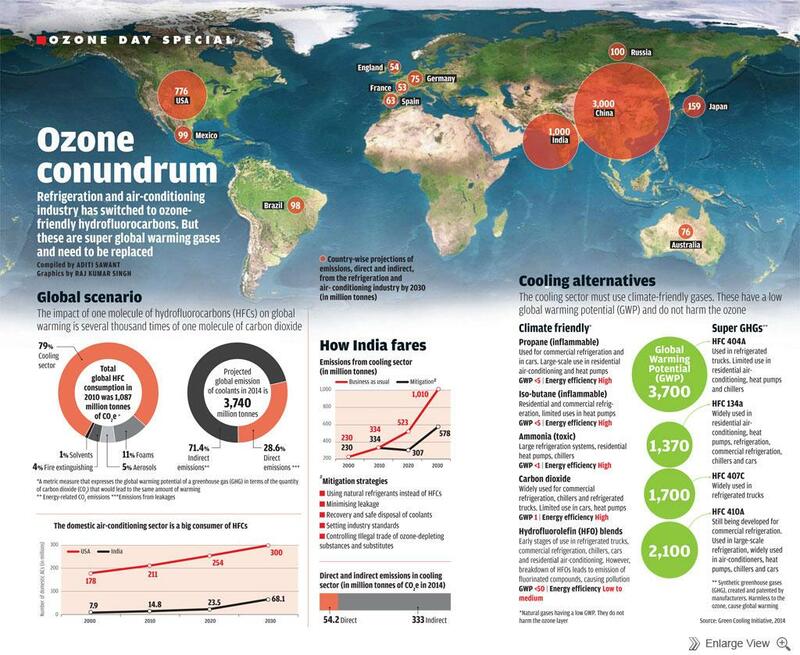 For comparison, the current emission of all greenhouse gases in India is about 2 billion tonnes CO2 equivalent. So, HFCs are a serious threat to climate and need to be urgently tackled at the global level. India has the option to move to HFCs but it will not pay in the long run. HFCs are one of the gases whose emissions are regulated under the UN Framework Convention on Climate Change. India has no mandatory obligations to reduce emissions under this convention. In the near future, however, India will have to take obligations to reduce emissions. It will then have to phase out HFCs because they are super greenhouse gases. 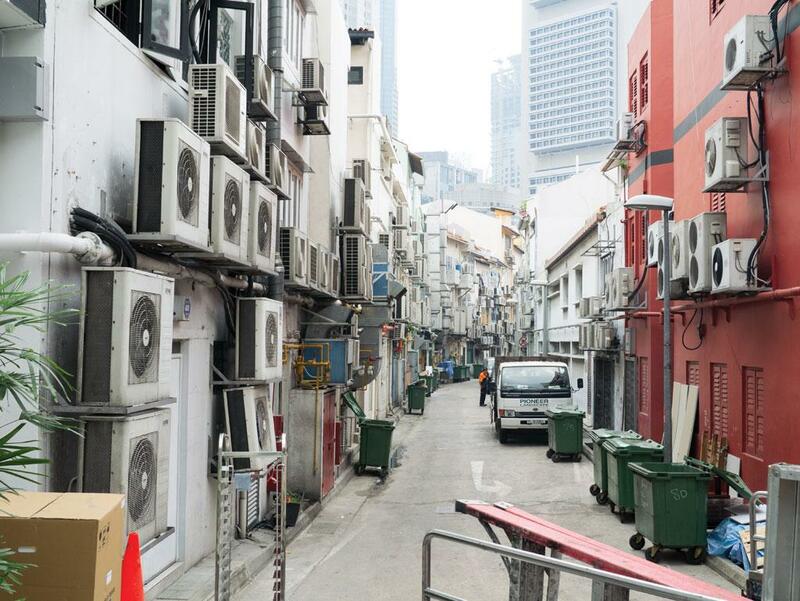 Many developed countries are pushing patented low-GWP refrigerants as a substitute for HFCs. US companies are pushing for hydrofluoroolefins (HFOs). DuPont is promoting HFOs as the “fourth generation” refrigerants. Japanese companies are pushing for HFC-32, a medium-GWPHFC, as the most energy-efficient substitute for HCFC. So does it make sense for India to remain on the chemical treadmill—CFCs to HCFCs to HFCs and then to chemicals like HFOs in the near future? Or should India leapfrog to natural refrigerants like hydrocarbons? Hydrocarbons were always the most appropriate substitute for fluorinated refrigerants. Their GWP is below 20 and they do not harm ozone. They are non-toxic (other than ammonia), non-patented, less expensive than fluorinated refrigerants and meet most of the specifications required for refrigerants. In fact, most hydrocarbons are more energy-efficient than fluorinated refrigerants. However, they are flammable and this has been the most significant barrier to their widespread application. In 1990s, the fluorinated gas industry used the flammability scare to kill the development of hydrocarbons. To support its companies, the US till recently banned the use of hydrocarbons as a refrigerant. Thankfully, Europe and some Asian countries went the other way. Companies have found that hydrocarbons can be used safely in applications ranging from household refrigerators and air-conditioners to commercial and industrial cooling and foam blowing. They have done this by redesigning the equipments as well as by training technicians to ensure they follow safety guidelines. Obviously, addressing flammability entails additional costs but these costs are offset by lower gas prices and superior performance. This is precisely the reason companies across the world are moving to hydrocarbons. In domestic refrigerators and freezers the use of hydrocarbons is rapidly increasing. Globally, close to 50 per cent of all new products use hydrocarbons. In India, Godrej has sold close to 10 million iso-butane refrigerators without any fire-related accident. In domestic air-conditioners propane and carbon dioxide are slowly catching up. China has set up the world’s largest production line of propane-based air-conditioners. Both propane and carbon dioxide have been found to have superior energy efficiency compared to HCFCs and HFCs. In fact, the most energy-efficient household air- conditioner in India uses propane. In polyurethane foams sector, HCFCs are being substituted with hydrocarbons in developing countries. Indian companies are moving to cyclopentane. It is quite clear that it would be rewarding, both economically and energy-wise, for India to make a one-time transition from HCFCs to non-HFC options like hydrocarbons. The million-dollar question is: will India leapfrog or will it keep protecting the interests of a few companies to the detriment of the whole sector? The technology and economic assessment panel (TEAP) established as part of the Montreal Protocol, recently came out with a comparison of the four amendment proposals submitted for the forthcoming hydrofluorocarbons (HFC) phase-down amendment. The report compared the proposals on two parameters – climate benefit and financial implications. It finds that the most ambitious proposals will make most financial sense in terms of CO2 abatement costs, in direct opposition of India’s stand. These findings are preliminary, drastically underestimate costs and do not consider the reduction in prices of newer technologies as time goes on. The report however, offers a window into the scale of the opportunity HFC phase-down offers in greenhouse gas mitigation. *In the case of the EU proposal, estimated costs are higher because no intermediate steps are assumed between the freeze date and 2050 (with a final 15% step reduction in 2050); reduction are proposed to be negotiated after the freeze. As an aggregate, these costs may appear high, however once they are seen in light of the GHG mitigation potential, they may offer a different picture. When converted into US$/tCO2 equivalent, the report reveals that carbon abatement costs for the HFC phase-down lie between $0.06-0.55 per tonne of CO2 equivalent. This is lower than the current price of carbon abatement in most of the major schemes around the world. The HFC phase-down should therefore be financially viable for developed countries even at substantially higher costs than stated in the TEAP report. Detailed analysis of the costs is given in the table below. The TEAP report may find opposition from Article 5 countries, on the grounds that it does not consider a discount rate—the rate at which the costs of newer technologies go down with time. This is crucial because a number of technology alternatives for HFCs are still new and therefore have high costs attached to them, which will come down over time. Building consensus around these differences in quantification of costs will play a major role for an eventual HFC phase-down amendment. but that was years and ages back. Today it gives me a cynical look from the ozone hole. it is just a voice that has airlessness to cross. What do I care about leaders such as Bush or Major? or the deep, fiery throat of NASA? Shouldn't your cat eat like a hero too? when we stop to rest and think. Nothing but green bile comes up even at a domestic summit. of a solitude that runs away as we continue to stalk it. do I have to worry? So what if rainforests go? The plush automobile still stands haughtily at the door. that they'd have to pay for the sins of past lives. In Africa and Asia with the silence of his voice. he has never answered and I so want to forget. This poem, exclusive to Down To Earth, was published in August 1-15, 1992 issue of the magazine.